[New for 2013] So there I am at Walmart, staring at all five new Breyer's blasts.... no no, let's try that again. There I was, me versus an empty shopping cart when I spied one of my favorite words: PRETZEL. It was one of the latest batch of Breyers blasts. In fact, all five new flavors stood before me, four came home, but now only one can be in my bowl. 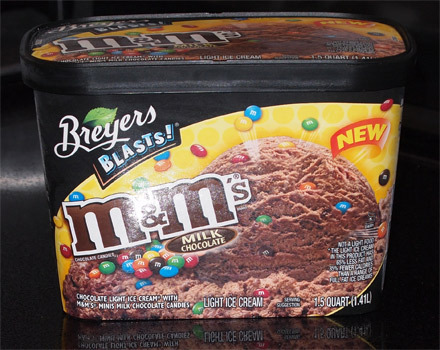 This is the new M&M's Milk Chocolate Breyers Blasts! Light Ice Cream. Sorry but I'm in a chocolate mood and it needs fixing. 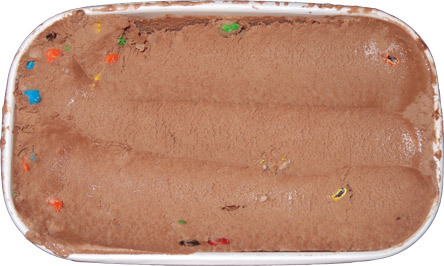 Chocolate Light Ice Cream with M&M Minis Milk Chocolate Candies should do the trick. Wow, there's something really unsatisfying about this ice cream. The milk chocolate is... iunno, more like frozen softserve than something that belongs in a freezer aisle. Texture is just terrible. Very slimy.... borderline soapy here. I know I rag on Breyers a lot and it's for a reason, they've lost their way since moving away from all natural ingredients. Man I want my money back. I don't even want to eat this stuff, it's that bad. I hate the way it feels. 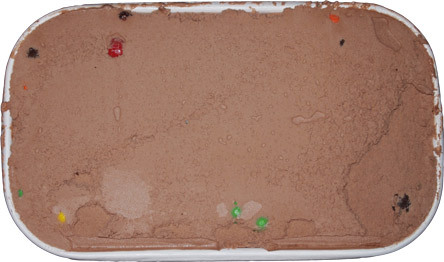 I even hate the way the little M&Ms fall out of the ice cream and jostle around my mouth. or would that be betraying her trust? I can't take it anymore. I'm going to stir this one up and hope for the best.... well, not best, but better anyway.... oh man, I think I made it worse. What in tarnation have they done? What is this abomination? This is no light ice cream, it's some bizarre scoopable lowfat fudge pop-like disaster. Ahhhhhhh!!!! On Second Scoop? Do I have to??? Leave your comments below and vote if I have to go back for a second scoop or not. Don't make me do it! Spare Me! I am not an animal!! Disclaimer: So my family would like me to add a disclaimer. My wife says "it's not that bad". My daughter ate some without complaint, though in my defense, she was using her small serving to wash down some vegetables. Me? Well, after a few small bites, I stand by my original assessment. This stuff is terrible. First, it literally turns into a puddle before you are done chewing. Second, there is something wrong with the "milk chocolate" here. Sometimes we talk about clean and crisp and rich and whatnot for some flavors, but here, dirty doesn't even work. There's just something really off about the flavor profile here. So yes, someone out there will enjoy this, some will tolerate it, but the lucky ones will save their money. Buy Again? Again?? I want my money back for the first time!! Nutritional Analysis: ingredients are skim milk (so no fat), sugar, mini M&Ms, corn syrup, cream (fat!! ), cocoa, whey, misc less than 2%. Just think about how little meaningful fat is in there for a few moments. Sure the label says fat, but I think that's from the M&Ms. No wonder the texture is horrendous. So frustrated right now. So not worth my $3.58. Starting to think less and less of products by Unilever. Most all of the Breyers is now frozen dairy dessert, and even the ice cream ones aren't that great (you mentioned this one, and I had their French Vanilla once, it was the most tasteless ice cream I've ever had). Other people have also mentioned to me that the quality of Ben and Jerry's (who I still think are excellent) and Popsicle has gone downhill. Thinking I'm gonna stick with regional brands Perry's and Turkey Hill. Please go back for a second scoop! No second scoop! Life is too short for bad ice cream. I really miss Bryer's when they only had a few ingredients. Did they change to save money? "8) Why did Breyers make the change to Frozen Dairy Dessert? Since 1866, Breyers products have consistently delivered high-quality ingredients, great flavors and smooth creaminess that our fans love, and we remain committed to that Pledge. Our Ice Cream and new Frozen Dairy Dessert varieties continue to use fresh milk, cream and sugar. What distinguishes our Frozen Dairy Dessert from our Ice Cream is that it’s blended in a whole new way to create a smoother texture. " Sounds horrible, don't do it! I wasn't planning on buying it after trying the Mars M&M's ice cream (sooo boring) but I think you just did the world a service with this review. No to a second scoop. Yes to a turning it into a milkshake. What were the other new flavors!? Please tell! hehehee, I'd rather not spoil the surprise. The way you described this reminds me of a discontinued Breyer's flavor I had a couple years ago. It was one of those fat free or low sugar chocolate ones and it tasted and had the same texture as a fudgesicle. I didn't really mind this as I expected it to be terrible, I would mind it if I expected REAL ice cream however. I ain't bought any Breyer's since I tried the mint Oreo blast and it was just horrible. Not even close to TH's Lady Liberty mint. I didn't enjoy this flavor either. The chocolate base wasn't great (even for a non-chocolover), but I think it would have been better had it used broken pieces of actual M&Ms rather than complete M&M minis; I'm probably crazy, but the minis taste bad, different than just being a small version of the real M&Ms. That's actually not a bad idea. I think the variety of M&M bits vs minis would break thinks up a bit. I dont think the minis are bad, they just don't seem to work here. I thought it was delicious! Says "Light Ice Cream with M&Ms" so my expectations weren't for a REAL ice cream (trying to watch my weight anyway so light ice cream is OK with me). And I figure to have the M&Ms logo they have to be actual M&Ms not generic? So it was exactly what I expected. Also as a side note - just tried the generic Dreyer's/Edy's versions of what used to be Girl Scouts, they are real ice cream but have the same weird ingredients as Breyer's Frozen Dairy Desserts - Gums, Carageenan, etc. but not nearly as flavorful as Breyer's Girl Scouts products. I bought a pint of Breyers Waffle Cone Blast. It is disgusting! I remember Breyers of the days of milk, cream, sugar, and fruit,and this is so far from the great ice cream they used to make. Never, ever, ever again! It's 2016, and it's still garbage. This review is perfect. Thankfully it was on sale so I don't feel that robbed. Should have came here first for a review!